At Home In Darien in partnership with the Mather Center, home of Darien Senior Programs, is presenting “Healthy Living For Your Brain and Body,” a Lunch and Learn program, on Tuesday, April 30. The program will be held at the Mather Center, 2 Renshaw Road, from 12 noon to 1:30 p.m. All Darien Seniors are invited to attend this free event. Lunch will be served at noon with the program immediately following. For centuries we’ve known that the health of the brain and the body are intimately connected. But now, science has shown how certain lifestyle choices may help keep your brain and body healthy as you age. Join us to hear more about research in the areas of diet and nutrition, exercise, cognitive activity and social engagement. Learn some hands-on tools to help you incorporate these recommendations into a plan for healthy aging. “We are looking forward to this informative program presented by Shanon Jordan, southwestern regional director, Alzheimer’s Association, CT Chapter,” remarked Gina Blum, Executive Director of At Home In Darien. If you’re interested in attending, please call At Home In Darien at 203-655-2227 by April 23 to make a reservation. Space is limited. 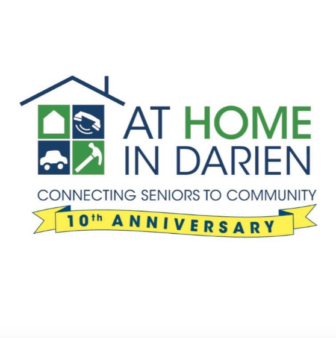 At Home In Darien is a non-profit 501(c)3 organization whose mission is to help Darien seniors live independently, comfortably and with dignity in their own homes and the community as long as possible. For information about services, or to find out how you can help support At Home In Darien, please call 203.655.2227 or visit www.athomeindarien.org. You are invited to attend a free hour-long session to become a Dementia Friend — someone who has taken the time to learn more about dementia and helps in small ways. Small gestures such as spreading the word about Dementia Friends or visiting someone living with the illness can help make our community Dementia Friendly.